The Tomos will be signed on 5 January and handed over to Metropolitan Epifaniy on 6 January. 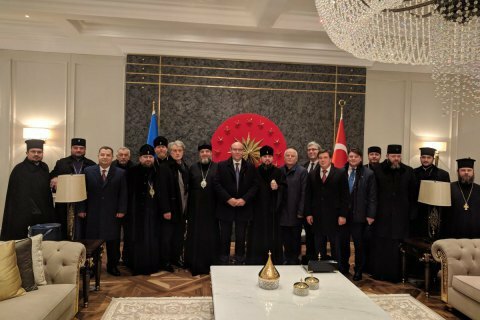 The Ukrainian delegation arrived in Istanbul to receive the Tomos from Ecumenical Patriarch Bartholomew granting autocephaly to the Ukrainian Orthodox Church. The delegation also includes Ukrainian Orthodox Church Primate, Metropolitan of Kyiv and all Ukraine Epifaniy, parliament speaker Andriy Parubiy, ex-President Viktor Yushchenko and Defence Minister Stepan Poltorak. A meeting with Ecumenical Patriarch Bartholomew is scheduled for 5 January. The delegation will attend the signing of the Tomos and the following prayer. Poroshenko and Epifaniy will make statements following the signing ceremony. The ceremony of handing the Tomos over to Metropolitan Epifaniy will take place on 6 January. The Ukrainian Orthodox Church uniting the Ukrainian Orthodox Church of the Kyiv Patriarchate, the Ukrainian Autocephalous Orthodox Church and part of the Ukrainian Orthodox Church of the Moscow Patriarchate, was established on 15 December 2018. Bishop Epifaniy was elected its primate and declared Metropolitan of Kyiv and all Ukraine.